Finally, after 24 years of slinging burritos, Chipotle will start serving its first-ever queso dip at all of its restaurants across the country on Tuesday. But before you get carried away by the tidal wave of hot cheese sauce, it's worth understanding why it took so damn long to happen. Turns out it all has to do with the recipe. While Chipotle execs have admitted that queso was far and away the most requested menu item by its customers, the burrito chain struggled for years to create a queso recipe that adheres to its strict requirements for all natural food and, you know, actually taste good at the same time. The company claimed it became the only national chain that doesn't use artificial colors, flavors, or preservatives in all of its food, when it started serving reformulated, all-natural tortillas in March. Now, it looks like the chain has done the same -- and cracked the code -- with its queso recipe, which includes only 23 ingredients, according to its website. 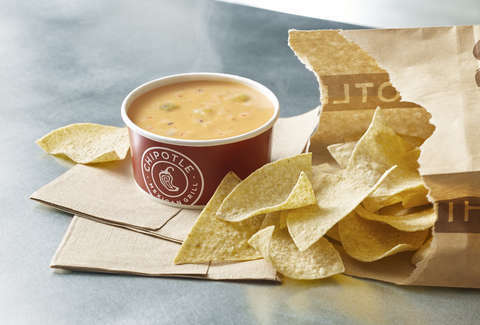 Chiptole boasts that its queso contains zero industrial additives, artificial colors, and artificial stabilizers, unlike other quesos on the market. 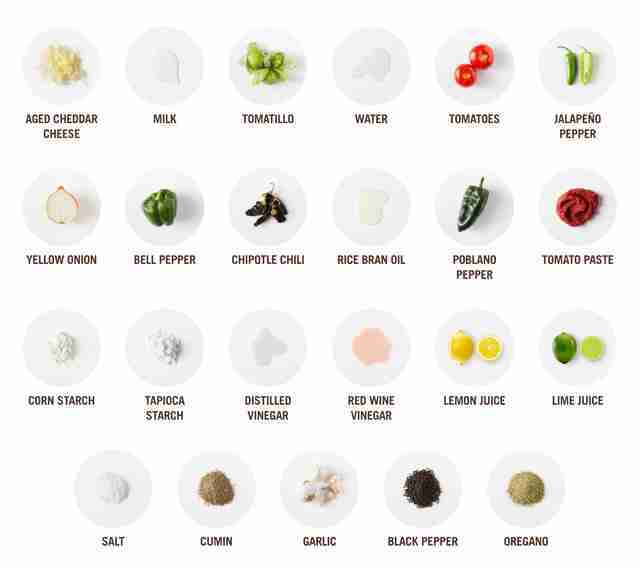 Instead, the recipe relies on ingredients (shown above) like aged cheddar cheese, tomatoes, tomatillos, milk, seasonings, and multiple types of peppers for its flavor and consistency, which could actually make the queso a little different every time to you order a cup or ask for it as a topping on your burrito bowl. Of course, it remains to be seen if people choose all-natural ingredients and varying flavors and textures over the existing queso options out there that almost always taste good, although they may contain artificial ingredients. The queso served during Chipotle's initial test rollout at more than 350 restaurants in California and Colorado in August was greeted with mixed reviews, but the company said it has since slightly tweaked the recipe and ingredient proportions based on customer feedback. So far, there's no indication that Chipotle will celebrate the cheesy launch with any deals for free queso, but you can add it to your next burrito, burrito bowl, or other entree for $1.25 or you can order it on the side with chips in two sizes, the larger of which will set you back $5.25. It would probably make for a good topping on the Chipotle Nacho Bowl we've been dreaming about for years now, too. Tony Merevick is Senior News Editor at Thrillist and still needs to try the stuff on a burrito bowl. Send news tips to news@thrillist.com and follow him on Twitter @tonymerevick.